With Skype Connect, your business can make great value Skype calls and receive calls from your customers using your desk phones. 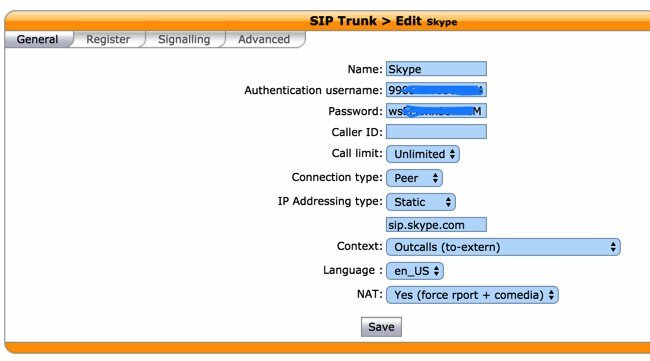 Customers can also contact your business for free by using Skype from a browser with Skype buttons, by calling [not for free] the Skype business accounts associated with your SIP-enabled PBX, or [by placing PSTN calls to Skype Numbers you may have purchased]. Before you can make or receive calls from Skype Connect on your Wazo PBX, you’ll need to set things up on both the Skype side and the Wazo side. Here’s how. To get started, sign up for a Skype Manager account if you don’t already have one. It’s easy and it’s the only thing that’s free. Once you’re signed up and logged in, you’re going to need cash in your Skype credit account to get things going. $30 will get you started but finish reading before you invest. First, click Features in the toolbar, choose Skype Connect and click Set up a SIP Profile. Give the profile a name "XiVO" and click Next. Next, choose the number of Channels you need at $6.95 per month. A channel gets you one simultaneous call in or out of Skype. Two channels gets you one call in and one call out simultaneously for $13.90 per month. You can take it from there but, sorry, you can only buy 300 channels at this time. You can also add the U.S. 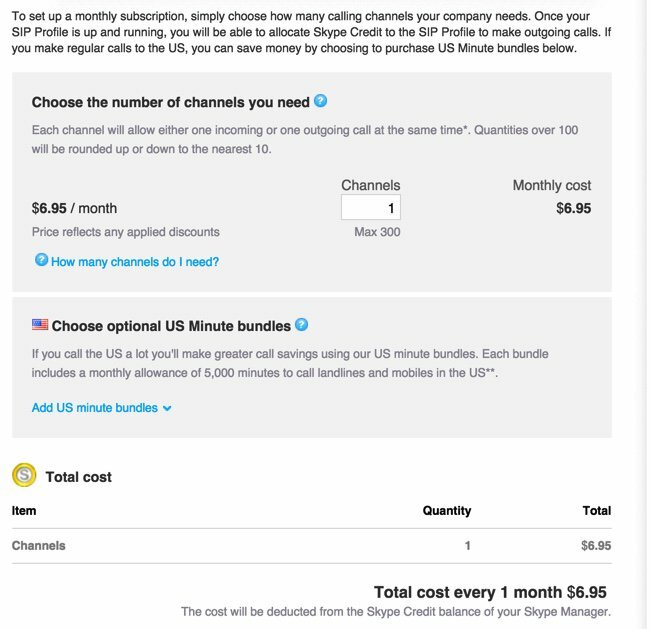 Minute Bundles if you make lots of calls in the United States. The money deposited into your Skype Manager account will be needed to fund Skype Connect in three separate ways: (1) monthly payments for Channels at $6.95 each,1 (2) monthly payments for Phone Numbers associated with those Channels at $6.30 each, and (3) allocation of funds in advance to pay for outbound calls from each profile you create. You’ll need at least one phone number (a.k.a. 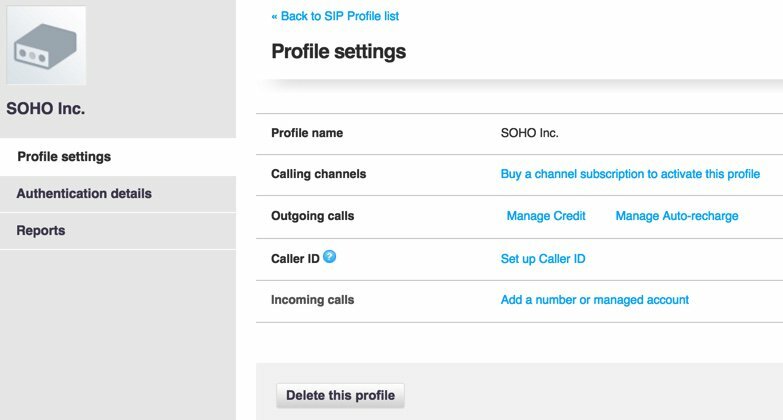 DID) to receive any inbound calls from POTS phones to the Skype Connect SIP account on your Wazo server. 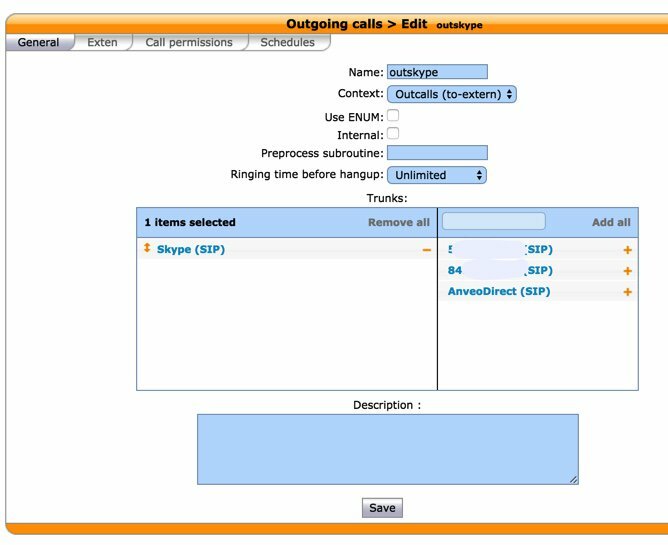 You’ll also need at least one phone number before you can assign a CallerID to your outbound calls.2 Otherwise, they go out as Anonymous calls. Outgoing and incoming calls using traditional Skype Names are not supported! Once you get your finances in order, it’s time to set up your SIP credentials for your new profile. Click on Authentication Details to display the dialog. 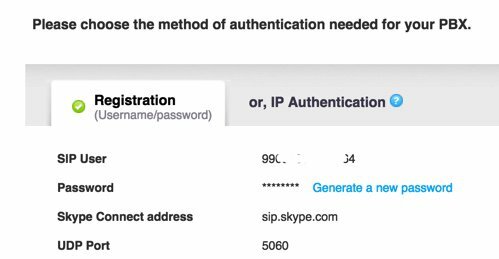 Leave the Registration tab highlighted, and click on Generate a New Password, and a new SIP password will be sent to the email address you used to register when you set up your Skype Manager account. Write down your credentials including the SIP password that was emailed to you by Microsoft. You’ll need them to configure your Skype Connect trunk on your Wazo server. 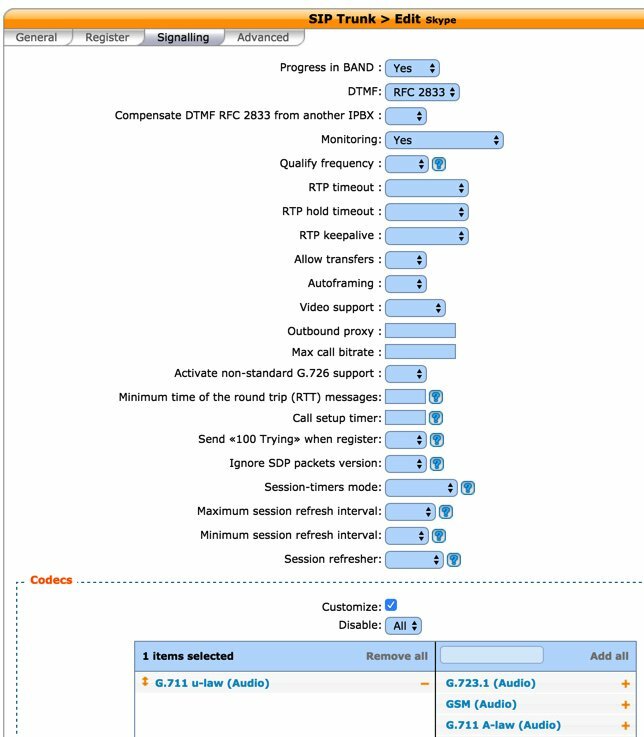 If you’ve already set up Incredible PBX for Wazo, then you can skip this first step which you should have already performed. In Services:IPBX:General settings:SIP Protocol under the General tab, make sure Match users with ‘username’ field is checked and SAVE your settings. 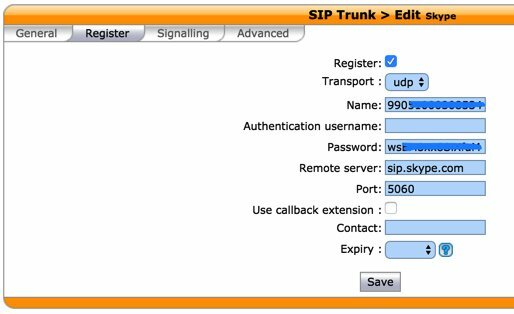 Next, create a new SIP trunk by click + Add after choosing Services:IPBX:Trunk Management:SIP Protocol. Make the settings under each of the tabs look like the following using your Skype Connect credentials. Then Save your settings. Create an outgoing route for your Skype Connect trunk by clicking + Add after choosing Services:IPBX:Call Management:Outgoing Calls. Make the settings under the first two tabs look like the following. 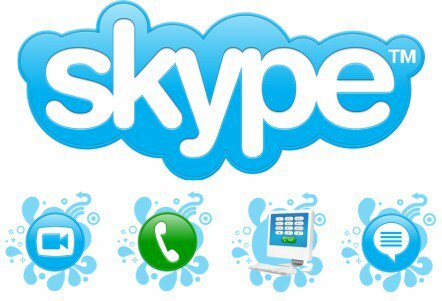 If you wish to use a dialing prefix for Skype calls other than 759 (S-K-Y), change the dial string accordingly. Save your new outgoing route. 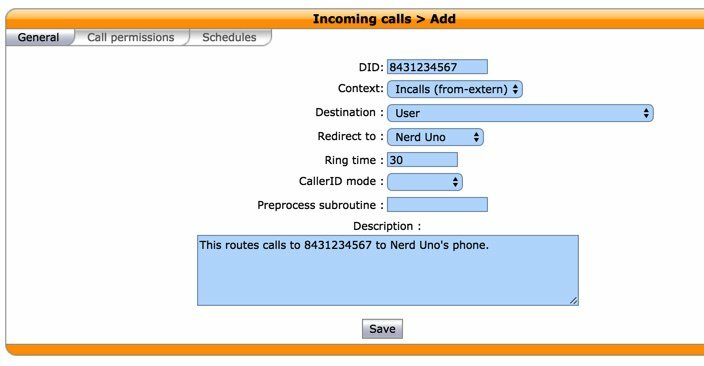 Create an incoming route for each of your Skype Connect DIDs by clicking + Add after choosing Services:IPBX:Call Management:Incoming Calls. Make the settings under the first tab look like the following. Enter the Skype Connect DID assigned to your account. Choose the destination for incoming calls to this DID based upon your specific requirements. Click Save when you complete the setup.